Jennifer Lopez teared up the first time she met “American Idol” hopeful Chris Medina — whose devotion to his severely handicapped fiancee made him a memorable contestant. But that was nothing compared to the breakdown she had when she had to send him home last night. 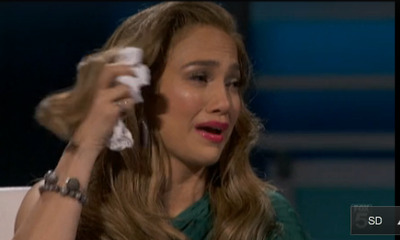 “I don’t want to do this anymore,” Lopez hiccuped between sobs. Somewhere Simon is shaking his head in disgust. Looks like the ‘Idol” pressure is getting to her. But it’s not all bad. Moments like this are great for Lopez, who has long been rumoured to be an unreasonable diva — now, all of America’s getting to know a much softer, sweeter image.